After 5 months of labor and love, Radius Annex is opening its doors to the public and we want to see YOU here! Its First Friday in the neighborhood and we are celebrating with TWO group gallery shows, open studio tours of our resident Annex artists, and the ribbon cutting of our Annex retail shop! First, stop at The Olympic Mills Building (107 SE Washington st) to see work from 25+ Radius Community Artists! Open 6-8 pm. 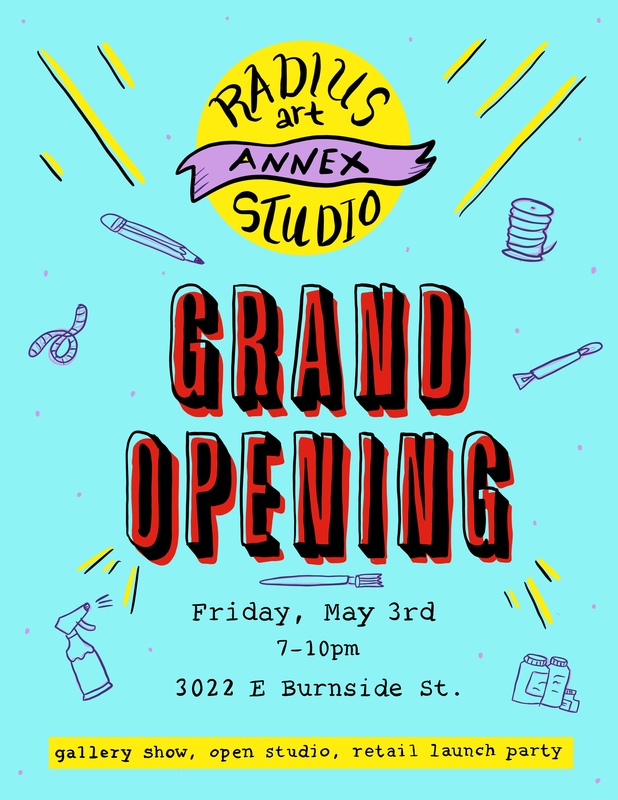 Then, head down to the new Radius Studio Annex location (3022 E Burnside St) to check out more of our artist’s work in the Annex Gallery and shop works from an amazing group of local artists from Radius and beyond! We will be drinking wine and selling goodies until 10pm! Both shows are Free, open to the public, and all ages. The Annex is wheelchair accessible, the Olympic Mills building has steps leading to the main entrance.